As always there was plenty to see at the RWM this year. Lots of the old regulars and some new faces bringing their products and ideas to the market. 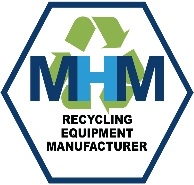 Here at MHM Recycling we appreciate the need to embrace new technologies and evolve with the ever changing markets and trends. Watch this space, MHM Recycling are working on major new developments in the recycling sector that will have real positives for productivity and efficiency. We are working on these new and exciting innovations as we speak and will be hopefully releasing more information soon. Stay posted for more news.